View Our Entire Newsletter Here! 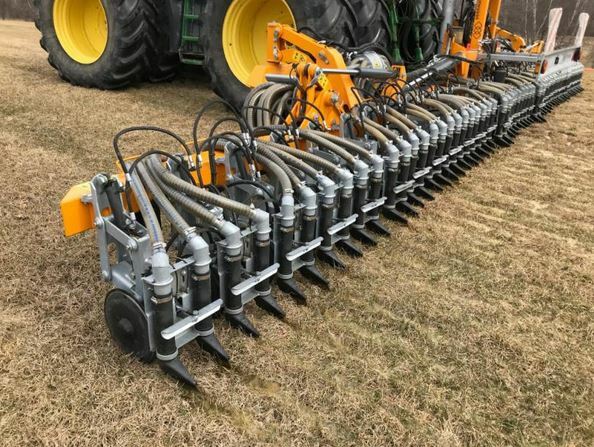 First, if you missed it, the Northwest Crop and Soil team organized a webinar series on tile drainage that is well worth checking out. It details why tile drainage is an agronomic tool, and covers research locally and across the US on how tile may affect water quality. There are also factsheets on pre-installation and tile maintenance. Second, VAAFM has just filed adopted tile drainage rule. RAPs amended to include language addressing nutrient contributions from subsurface tile drainage. November 14, 2018 / Montpelier, VT – On Thursday, November 8, 2018, the Vermont Agency of Agriculture, Food & Markets (VAAFM) filed the adopted rule amendment to the Required Agricultural Practices (RAPs) with the ;Legislative Committee on Administrative Rules (LCAR) and the Secretary of State (SOS). The amendment includes requirements for reducing nutrient contributions to waters of the State from subsurface tile drainage on agricultural fields. The new rule will become effective November 23, 2018. Subsurface tile drainage removes excess water from agricultural soils below the surface, usually through a system of plastic piping (image attached). The rule amendment was adopted on November 8, 2018 and will take effect on November 23, 2018. The requirements of the rule amendment include the required installation of rodent guards on subsurface tile drainage outlets installed or modified after January 1, 2019, the prohibition of new installation of surface inlets located within or next to cropland following the effective date of the amendment, and other provisions focused on reducing nutrient losses from subsurface tile drainage. The formal rule amendment process began in January 2018 when the Agency pre-filed the proposed amendment with the Interagency Committee on Administrative Rules (ICAR). ICAR reviewed an amended pre-filing set on February 12, 2018. VAAFM made several recommended changes and formally filed the proposed rule on February 28, 2018. Prior to initiating the formal rule amendment process, the Agency was engaged in various discussions and nine meetings to gather feedback pertaining to the content of the amendment, involving 190 attendees that provided insight as the rule amendment process began. Following the filing of the proposed rule, the Agency held a public comment period which ran from February 28, 2018 through April 20, 2018. During this time frame, the Agency held three public hearings in St. Albans, Montpelier, and Middlebury to gather additional feedback on the proposed rule, in which 33 interested individuals attended. Overall, the Agency received over 50 written and emailed comments on the proposed rule amendment. The final proposed rule was filed with LCAR on August 21, 2018. The Agency attended three LCAR review hearings on September 6, 2018, September 20, 2018, and October 18, 2018. On October 18, 2018, the LCAR voted 8-1 to approve the subsurface tile drainage rule amendment. Please direct any questions regarding the proposed amendment or the RAPs to agr.waterquality@vermont.gov or call (802) 272-0323. Every winter we teach Nutrient Management Planning (NMP) classes. Because those NMP’s have to be updated yearly with both records and new plans, we also set aside time for previous attendees to come back and update their plans. Update sessions are free, but PLEASE RSVP! Location: UVM Extension Middlebury Office, 23 Pond Lane Suite 300, Middlebury, Vt. Location: The Stonebridge, 38 Beaman St, Poultney Vt. Location: Pawlet Free Library, 141 School St, Pawlet Vt. Location: Rutland Free Library, 10 Court St, Rutland Vt.
Time: 10 a.m.- 12 p.m. Location: Field on Rattlin Bridge Road 1 mile west of Route 22A in Bridport, Vt. Please join us to take a look at fall cover crops in Bridport, Vermont. 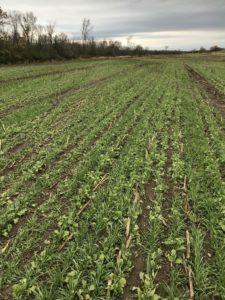 We will see and discuss multiple cover crop combinations in large field-scale plots including oats, winter rye, winter wheat, winter triticale, winter barley and radish. Discover the advantages and disadvantages, seeding rates, timing, manure applications and more. Special thanks to Blue Spruce Farm for hosting these plots and our field day. Water Quality Credits available for farms and CCA credits available for Certified Crop Advisers (pending approval). Time: 5:30 p.m – 9:00 p.m.
Join us as we celebrate another successful year promoting Vermont Agriculture. Hear about hot topics facing Vermont Agriculture and what we as a community can do, followed by evening entertainment from a local comedian. This is a free event, which includes dinner and an annual report of the Coalition’s and UVM Extension Champlain Valley Crop, Soil and Pasture Team work. More Information will be posted on the Coalition Website. Join us and submit your entries! VT Farm Show Website. 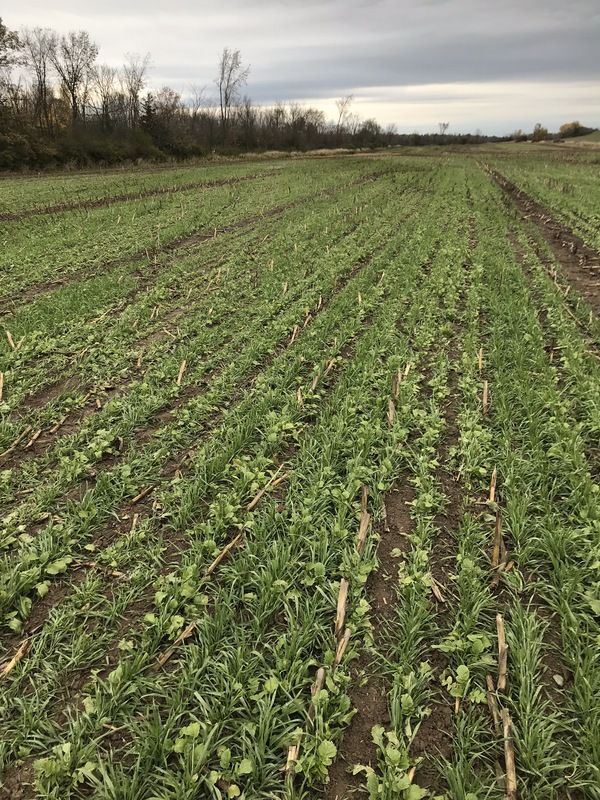 From dry conditions to wet conditions, come discuss with local farmers how adopting cover crops and no-till is helping them save fuel, money and improve crop yield. 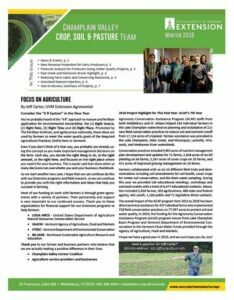 Talk to ag dealers, learn about funding programs, get updated on the latest research and approaches across the country, and help lead the soil health movement. More Information to come on our website. peril: lack of precipitation. A crop insurance agent will be able to assist you in working through the RMA online Decision Support Tool to help you determine whether or not PRF is the right choice for your farm. To help make your decision, there is a PRF decision tool online. 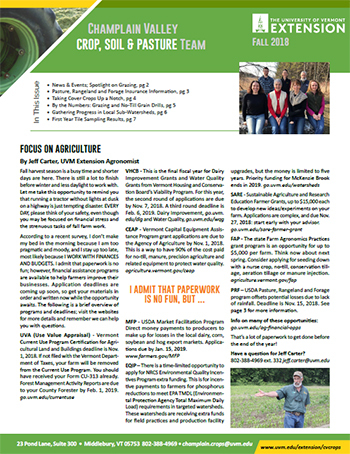 “Farmer Grants are for commercial producers who have an innovative idea they want to test using a field trial, on-farm demonstration, marketing initiative, or other technique.” More information and application online. “This two-year program enables new farmers to advance their farming skills and experiences while being a part of a learning community of other beginning farmers and farmer mentors.” More information and application online. There is a newly revised General Permit (GP), as of June 2018, that VAAFM has to renew every five years, under which all MFO permits operate. This means all MFOs have to re-declare their intent to comply by filing a new Notice of Intent to Comply (NOIC) Form. More Information can be found on VAAFM website, or call (802) 828-2430. As of December 15. 2018, and no spreading on saturated or snow covered ground. More Information. “The Market Facilitation Program (MFP) provides direct payments to help corn, cotton, sorghum, soybean, wheat, dairy, hog, shelled almonds and fresh sweet cherries producers who have been directly impacted by illegal retaliatory tariffs, resulting in the loss of traditional exports.” Read more online, or call your local FSA office. (Above) Participants discussing pasture management techniques in our Grazing Planning Class including the use of a grazing stick to determine pasture yield based on plant species, plant density and pre/post grazing height. 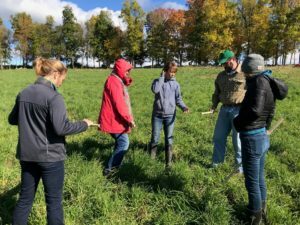 July 26 – Borderview Farm, Alburgh, Vt.
Join Heather Darby’s crew to learn about the many research projects going on behind the scenes at Borderview Farm. 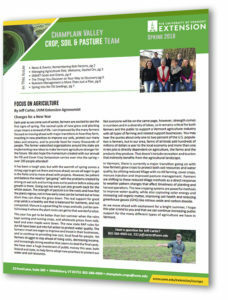 For more information visit go.uvm.edu/nwcropsoil or contact Susan Broulliette, 802-524-6501 ext. 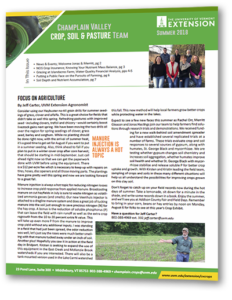 July 28 – Kayhart Brothers Farm, West Addison, Vt.
Join us to learn about new and exciting ways to manage crops and nutrients on farms. Hear from regional and international speakers about innovative practices and equipment that can improve farm economics and natural resources. There will even be a live equipment demo after lunch! Contact Nate Severy for more information, 802-388-4969 ext. 348 or nathaniel.severy@uvm.edu. August 7-11 – 1790 Field Days Road, Vergennes, Vt.
we will be displaying your crops! Farmers, we NEED your entries to make our display a success! Contact our office (802-388-4969) with entry questions and drop off entries at the fairgrounds by noon Monday, August 6.
for more information on this program or contact Tony Kitsos, 802-524-6501 ext. 440, tony.kitsos@uvm.edu. Read our entire newsletter here! As seen in our Summer 2018 Newsletter – but including additional links below. ever “see” you at work. While that is often viewed as a positive, it also leads to a disconnect between farmers and neighbors. opens up to the nonfarming community, the results can be powerful. your daily farming pursuits and hopefully that will have a lasting effect. Breakfast on the Farm – Don’t be intimidated by the scale of this event. It is well-organized and supported by hundreds of volunteers and experts who are there to represent you and the farming community well. Want to learn more? Volunteer on July 28 and see what it’s all about. Open Farm Week – A Dig In Vermont coordinated, week long event. For a small fee, any farm can participate and be promoted across the state. You must welcome visitors and host some sort of farm activity. However, technical assistance is available to help create a valuable on-farm experience for participants. Crops Exhibit and Farm Product Contests – Join the competition at Addison County Field Days or Vermont Farm Show with hay, crops, honey, eggs and vegetables. Not only can you earn blue ribbons, premiums and bragging rights; you help us educate the public about farming in Vermont. Cabot Open Farm Sunday – Cabot Creamery and AgriMark Farms can participate in Cabot’s Open Farm Sunday in October. Workshops/Field Days/Tours – Volunteer! The next time your friendly Extension Agent, Crop Consultant, Feed Consultant, or Politician asks if you’ll host a group at your farm…just say YES! 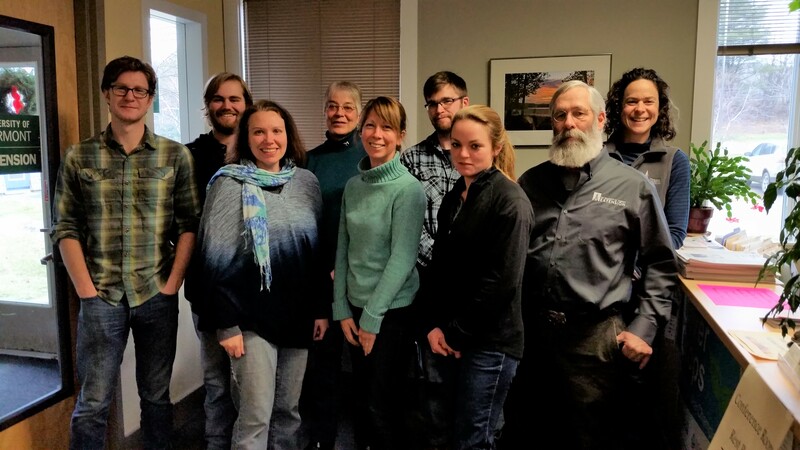 Champlain Valley Farmer Coalition – Join the Champlain Valley Farmer Coalition and find like-minded farmers with good tips and tricks on engaging the public on your farm. Other farmer organizations in Vermont include Farmer’s Watershed Alliance and Connecticut River Watershed Farmers Alliance. Thursday, June 14th – 10:30 a.m. – 1:30 p.m.
Join us for a grazing field day at Islandacres Farm in South Hero. Grazing consultant Sarah Flack and Cheryl Cesario of UVM Extension will lead a pasture walk with farmer Steve Robinson of Islandacres. Steve and his family are transitioning their 70-cow dairy to management-intensive grazing. They have seeded down 60 acres to perennial pasture as a way to mitigate the risk of annual cropping systems. We will look in-depth at this newly designed system and hear about the benefits and challenges of a transition to grazing. Discussion on grazing topics will be from both the plant’s and the animal’s perspective. With help from NRCS funding, this farm is investing in fence, animal trails, and a water system for efficient grazing to maximize the land base. Islandacres has been a top quality milk producer for 30 years with a focus on animal health and production. Come see how they are adopting these new management practices! Contact Cheryl Cesario with questions.